In the autumn, we were doing an inventory of our storage facilities, double-checking the placements we have noted in our database with the physical placements of the artefacts on our shelves. And it came as no surprise that we found several funny or interesting artefacts that we hadn’t come across before. There was one box, which took the prize as the most curious. The first few artefacts listed were nothing extraordinary: a couple of ponchos, some textile, an apron… and then came the last line: ‘A small vial w. nails’. Double take. 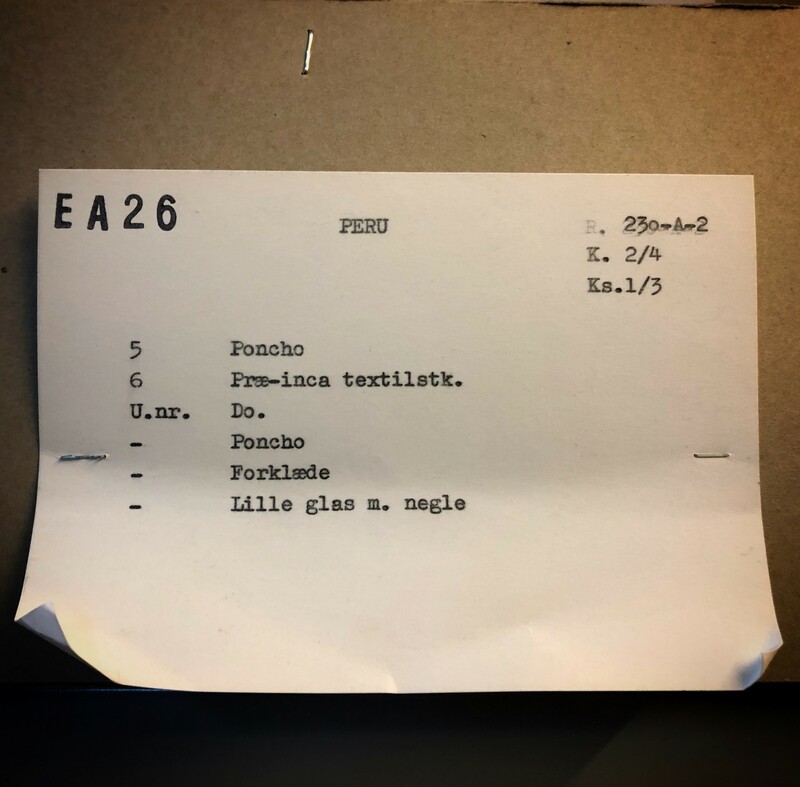 A small clue as to why we have a vial of human fingernails is actually to be found in the description of the textile piece on the label: ‘Præ-Inca’, or ‘Pre Inca’. 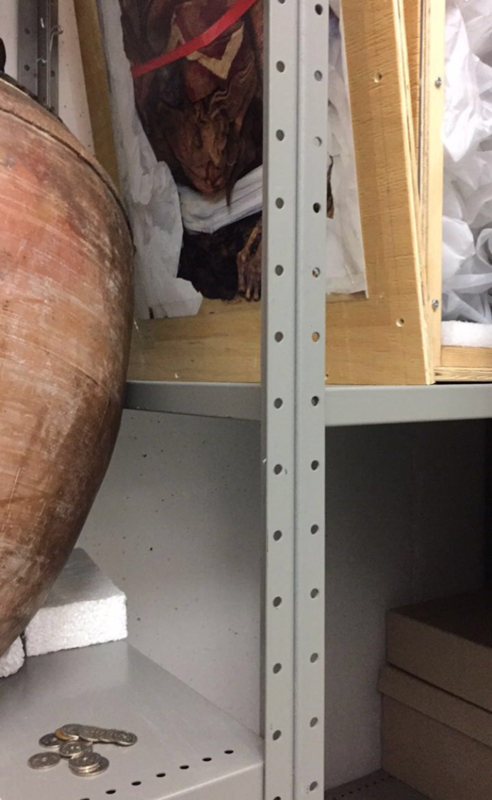 The fingernails actually belong to our Chancay mummy, but have fallen off his old, withered hands and been put into a little glass vial. Calling it ‘pre Incan’ is not entirely correct, though, as the Chancay culture was part of the Incan Empire, which lasted from the 13th century until the Spanish conquest, during which the last Incan stronghold fell in 1572. We do not know much about our mummy. We guess that he lived in the 1400s, perhaps sparing him from the horrors of the Spanish conquistadors and their accompanying epidemics of smallpox, typhoid, influenza, measles, and whatever else they brought with them. Our mummy came to Denmark with Danish explorer and adventurer Jørgen Bitsch, but took a detour through the main entrance of the big Danish newspaper Aarhus Stiftstidende, where he sat on display, presumably creeping out quite a few unsuspecting employees and visitors. And now he, and his vial of fingernails, rest here in our storage facilities. But he is not forgotten – indeed a strange custom has developed where people leave him little coins, to appease him and ensure that he is happy and content. And wouldn’t you, if you had to work all alone down in some dark and cold corridors, with only a mummy (and his fingernails) for company? The pile of coins lie next to the mummy’s crate – let’s hope he likes them!